A NEW ultra-compact, leadless package that provides space savings of as much as 60% compared to the SOT23-6L has been introduced by Vishay Intertechnology, represented by Braemac , with the release of the first two ESD protection arrays in the new LLP75 package. Optimised to offer electrical performance and extraordinary space savings, the new GMF05C-HS3 and GMF05LC-HS3 five-diode arrays are intended for I/O line protection applications in compact and handheld products including mobile phones, notebook computers, PDAs, digital cameras, and other space-constrained electronic systems. Both new devices are specified to meet the immunity requirements of IEC 1000-4-2, offering ESD protection to 15kV (air) and 8kV (contact). The GMF05C-HS3 ESD protection array features peak pulse current of 12A and peak pulse power of 200W at a 8/20µs waveform. Total capacitance for the device is 150pF. 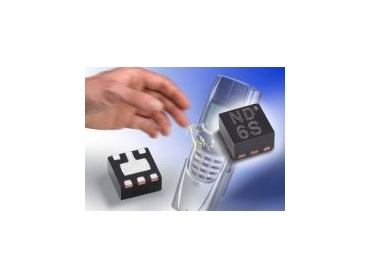 The GMF05LC, intended for low-capacitance ESD protection, features peak pulse current of 8A and peak pulse power of 100W at 8/20µs waveform, with a low total capacitance value of 50pF. Reverse stand-off voltage of 5V in both devices, as well as low leakage current and low operating and clamping voltages, further enhances electrical performance. The GMF05C-HS3 and GMF05LC-HS3 are packaged in the new LLP75-6HS, a leadless plastic package with an integrated heat sink and compact dimensions measuring just 1.6 mm by 1.6 mm with a 0.7-mm height profile. Each diode array offers bi-directional protection of four I/O lines and unidirectional protection of five output lines. The new devices are specified for an operating temperature range of -55°C to +125°C.